Whether your are booking from Saudi Arabia, UAE or Kuwait to Chennai flights, then you are at right place, get flight schedules and book low airfare Chennai flight tickets at Rehlat with all major airlines: Air India and Kuwait Airways. Previously known as Madras, Chennai is one of the fourth metropolitan of India and a major business and tourist hub. Book Chennai flights today to explore the city that has the most talked about Marina beach and shop the beautiful dazzling Kanjeevaram sarees. Browse through the long list of Chennai flights available for your travel date and choose the one that suits your pocket and mood. Rehlat assures you of the best price and the lowest fare for Chennai flights. Chennai is the perfect destination that is loaded with a range of tourist attractions and beautiful beaches. It has the second longest costal line city in the world. Chennai is convoluted with its world class beaches, historical sites, ancient temples, shrines and museums. Tamil Nadu’s capital city Chennai is filled with some of the excellent tourist attractions including Marina Beach, Government Museum, Guindy National Park, Birla Planetarium and Lighthouse. 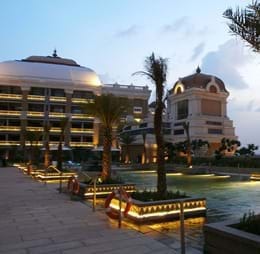 Chennai will give you a great shopping experience with its luxury shopping malls and colorful street markets. Sir Thyagaraya Nagar Road is one of the most prominent places in Chennai, where you can find affordable clothes and jewellery shops. Chennai has a wonderful mix combination of traditional customs and the contemporary culture. Chennai is one of the finest dining capitals in India that offers local and international cuisines. You can find numerous classy restaurants with multi continental cuisines across the city. Never miss to taste delicious ‘Idly & Sambar’, which is the trademark breakfast of Chennai and is followed by many local specials. You can see the many restaurants ranging from budget class to upper class in vegetarian and non-vegetarian. Chennai’s nightlife scene has grown in recent years owing to the IT corridor growth. However, due to regulation, most of the bars and night clubs close at midnight. Happening night places in Chennai are the Zara’s, The West Minister, Flame, Le Club, 10 Downing Street, Pasha, The Leather bar, and much more. The local transportation in Chennai is quite easily accessible for getting around the city. There are various modes of transportation including buses, cars, taxis and auto-rickshaws. Fare of trains and buses are cheaper when compared with other modes of transport. Chennai International Airport is the major airport serving the South Indian City, Chennai. It is the fourth busiest airport in India in terms of international arrivals. This airport is a main hub for Air Carnival and Blue Dart Aviation. Passenger Terminal: This terminal is used for domestic and international operations, which is connected by a link building. It has excellent facilities including the high-tech x-ray baggage facilities, executive lounges, Duty free shops, retail shops, restaurants, and snack bars. Haj Terminal: This terminal is used for Haj pilgrims and operates only during the period of Haj Pilgrimage. Haj Terminal serves more than 600 pilgrims at a time. Chennai International Airport offers plenty of options for visitors to get into the city center. There are different modes of transport including trains, buses, taxis, shuttle service and car. Taxi and cab services are available 24/7 at an affordable cost.